We were born into a world that came with certain conditions and was already arranged a certain way. That is how we know it. We have never felt anything else and we have gotten so used to this world (in which everything is so natural for us) that we don’t imagine that it is subjective, and could be completely different. Our imagination and fantasies do not go beyond the boundaries of what we have gotten used to in this world. That is why it is difficult for us to understand what the Kabbalists say about another reality, which is revealed to a person if he attains a new level of perception. Today, we are awakening to a new reality, and as the entire world reveals this new reality, this perception will cause people to change. As the new reality is born within us, the science of Kabbalah talks specifically about how we can develop the inner feeling of this new reality within ourselves and avoid the suffering that we will experience should we choose to come to this involuntarily. 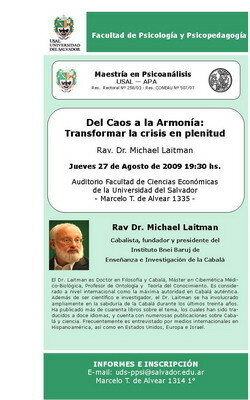 Prior to the start of the South American Congress on August 28-30, I will hold a public lecture in Buenos Aires, Argentina on August 27 at the USAL University. The lecture will be translated live from Hebrew into Spanish and English. There is no slavery worse than being enslaved to your own egoistic nature. The breaking did not occur to myself, but to my connection with others. Thus, it is the interconnection among the souls that we have to correct. The Talmud Eser Sefirot describes the unification of the souls, as they overcome the egoism that becomes revealed in them. The only thing that comes from Above is the spark that ignites the fuse. But the flame within the soul continues burning in virtue of the efforts we make during the period of concealment. A question I received: I’m studying the videos and texts on the site and I’ve been learning a lot! I’m a teacher of philosophy in Brazil and my focus of study is the thinker Baruch Spinoza, a cherem Jew of the seventeenth century. Spinoza spoke about a God like Nature, a God not external, but internal and equal to Nature (where Nature is not seen only as trees, clouds, and so on, but the superior Nature that includes all of thing and energies). How does Kabbalah see God? And what does Kabbalah think about Spinoza’s philosophy? My Answer: There is a huge difference between the definition of “God as Nature” in Kabbalah and in Spinoza’s philosophy. For example, there are differences in how they see the Upper Force as having a mind and a will, to make decisions, its goal and program, its separate, superior position over Nature, its causality and primacy, and so on. It would be best for you to sort all of this out for yourself. To do so, it will suffice to browse through several articles by Baal HaSulam: “The Wisdom of Kabbalah and Philosophy,” “The Essence of the Wisdom of Kabbalah,” Part 1 of “Talmud Eser Sefirot” – Histaklut Pnimit (Inner Reflection).” Once you read them, I will be happy to speak with you on the subject. I will be in Argentina from August 26 until September 2.